Home Tags Posts tagged with "POC"
One of the most common questions that tends to be asked when someone finds out that they need to start using an oxygen concentrator is whether they can bring those devices with them when they are traveling by air. Traveling with oxygen can be tricky, and they want to know if they might need to change the way that they travel because they have a need for oxygen. Fortunately, it should not be a problem in most cases. In 2009, the United States Department of Transportation’s final rule “Nondiscrimination on the Basis of Disability in Air Travel” went into effect. This ruling provides air carrier requirements when it comes to the use of respiratory assistive devices during air travel. The rule currently requires that air carriers that are offering service to passengers are required to allow someone who has a disability to use a portable oxygen concentrator that has been approved by the FAA for use in flight. This includes all flights that have a maximum capacity of more than 19 passengers. The only time that they do not have to abide by this rule is if the device does not meet the FAA requirements. It must also have a manufacturer’s label that shows that the device meets the requirements. The goal was to have all of the portable oxygen concentrators to have labels on their devices by the time the rule was implemented. However, that has not happened, and many of the devices still do not carry the label. The FAA does have a list of the approved concentrators on their website, though, and if you plan to travel, this list should serve as a guideline on which of the concentrators you should consider. In addition, you can check with the manufacturer and ask them if they are FAA approved or not. The following are FAA approved portable oxygen concentrators that could be a good solution for travelers out there. This is the first POC designed to weather everyday life including daily bumps and varying climates. Invacare incorporated innovated design elements for simplified maintenance and faster serviceability. Top load batteries can be hot-swapped. Rugged and small weighing only 4.98 lbs with a single battery without carrying case. It provides 5 hours of battery life @ pulse setting. Travelers feel safe with the Invacare Platinum Mobile Oxygen Concentrator. 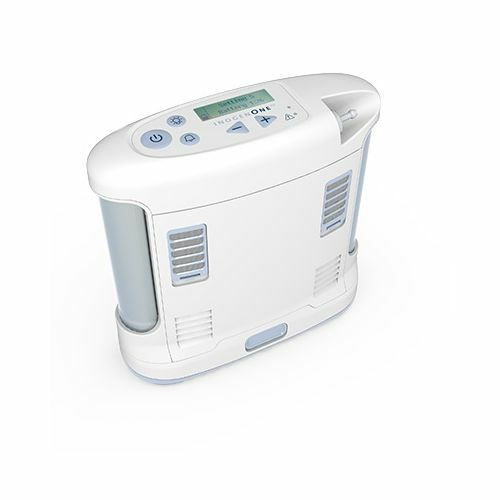 This is a pulse dose oxygen concentrator that is small and only weighs 4.4lbs with the internal battery. It provides 3.5 hours of battery life. This is a popular option among users who are active and who like to travel. It is easy to use and there is an additional battery belt that can be purchased that will provide an added six hours of use on the second setting. This machine is a pulse dose concentrator that weighs a mere 2lbs with the micro batteries. It has 1.5 hours of battery life per battery, and it uses two batteries for a total of three hours. This is extraordinarily lightweight, which makes it a good solution for those who want to have a wearable solution that will not take up much room. It works well for those who are traveling long distance and who want to be as mobile as possible. Here is one of the most popular options on the market today. 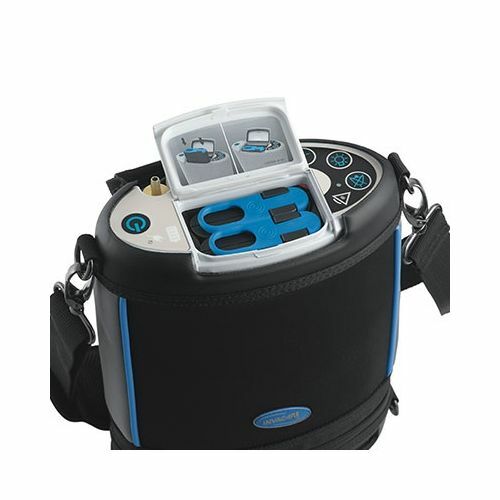 This pulse dose option features a weight of just 4.9lbs with the 8-cell battery. On the second setting, this battery can last for up to four hours. It is a durable, small, and easy to carry device that makes it a winner with travelers in the United States and beyond. It is small enough to hold in one hand, so you will not need to have a rolling cart for it, as you would have to do with the old oxygen tanks. These are just some of the POCs that have been approved by the FAA. There are other options that could work for you, but if you are buying without looking at the list on their site, you will want to make sure that you take the time to check with the manufacturer about their approval rating. In addition, if you are not certain, consider contacting your airline to ask them directly, and make sure that you have proof of their answer. Additionally, when you are flying with one of the approved devices, you will want to consider the flight time and how long the batteries will last on the device. This will let you know how many batteries you will need and whether you might need to charge them at any point during the trip. Before you engage in air travel, make sure you have everything taken care of for your oxygen and that you have a machine that is approved and can last for your flight.